An elderly woman votes in a past election. Courtesy photo. NAMISINDWA–Polling stations in Namisindwa district are registering a low turn up of voters as people in the district seem to be going about with their normal businesses. Namisindwa, which became operational in July this year, is among six new districts voting today for district chairpersons and Woman representatives in Parliament. Canon Grace Namukhula (NRM), Irene Watsemba (FDC) and Sarah Netalisire (Independent) are contending for the district Woman MP seat while George Wiliam Wopuwa (NRM), Jackson Wokoika and FDC’s Fred Wekesa are tussling it out for the district chairmanship. PML Daily has learnt that much as the election materials were delivered early in most polling stations, very few people have been turning up to vote. By 10:30am, all candidates had cast their votes with the anticipation of urging their supporters to also follow suit. “It is sad that people seem not to take this election seriously but I hope they will turn up later in the day to cast their votes,” FDC’s Watsemba said after voting at Magale cooperative polling station. However, voters in Namisindwa technical school polling station said the voter register in not corresponding with the community names. 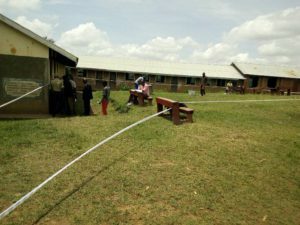 Police have been called to quell possible violence as voters who had queued to vote bitterly exchanged with polling officials. Voters were very few as the voting exercise started. Photo by David Oduut. Meanwhile, security has been tightened in the district as voters strall in to cast their votes. PML Daily has seen several military and police trucks patrolling some areas in the district. Suwed Manshur, the Elgon Region Police spokesperson, while addressing the media said they have deployed heavily to ensure the elections are peaceful. He said the heavy deployment is based on past elections in the area which were marred by violence. Jackson Wakweika, the Interim district chairperson, who is running as an independent, has welcomed the deployment, saying it is necessary to keep law and order during the elections. He said both the UPDF and Uganda Wildlife Authority security personnel were called in to back police. According to Manshur, the officers have been deployed at all the 192 polling stations while others are patrolling the district to respond to any emergencies.